Musical has described Joshua's life since he was able to sit up and play a toy xylophone. 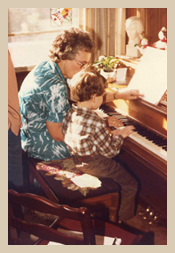 He was able to match pitch with his voice and the tones on his toy instrument at 1 ½ years old. 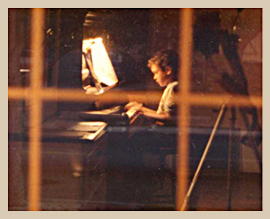 Joshua started studying music at the piano at 5. At age 10 while studying the trumpet so he could play in his school orchestra, Joshua's teacher flew out of the room while giving Joshua a lesson to declare that Joshua has perfect pitch. So began a lifetime of studying music: piano, trumpet, guitar, ukulele, violin, voice, vocal jazz, choral singing, barbershop, musical theatre, and composing, pointing in the direction of jazz and musical theatre. Joshua's teachers groomed him to become a strong singer, jazz pianist, jazz instrumentalist, actor, and musical director of musical theatre. They were: Mrs. Martin, Joy Siegler, Debbie McCarthy, Herb Mickman, Joanne Grauer, Liz Kinnon, Woody James, Frederick Stromberg, Bobby Sexton, David Arnay, Neal Desby, Chelsea Whitaker, Jean Sur, Terri Olson, Tim Johnson, Ricki Gole, Carol Weiss, Scott Harlan, Glen Carlos, Greg Jasperse, Jay Cohen, Pierre Karlsson, Jeremy Castillo, Matthew Lake, Jack Kovacs, Carol Halter, Patsy Metzger, Jim Taylor, Greg Poland, Mike Witmers, Pat Rico, Joe Salazar, Timothy Wayne, Maria Gobetti, Eugene Butler, Helen Crosby. Their teaching always will be a part of him. 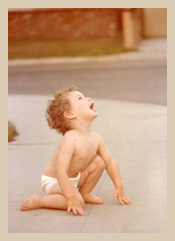 Joshua personally chose or approved all his teachers, designing his education toward his development. Joshua studied music and musical theatre at Hamilton High School Music Academy with Richard Schraier, Lynn Levine, and Sid Lasaine. He was active in 7 musical productions while at Hamilton and fell in love with playing and singing jazz. While still in high school Joshua began auditioning and scored the lead in Brighton Beach Memoirs playing Eugene. He went on after graduating to get a starring role in West Side Story playing Riff and in Guys and Dolls playing Benny Southstreet, which earned him an Ovation nomination. He landed a great part playing El Gallo in the Fantastiks also earning him a nomination for a Garland. Joshua really enjoyed playing the Emcee in Cabaret and got his first role playing the piano and singing in Godspell for a theatre group in Long Beach. Then he was in the 5 person revue, The All Night Strut. That time he sang and tapped danced. He followed up with the tap dancing chorus in Crazy for You. It wasn't long before he was cast in the European tour of Grease and an Equity production of Fame. Joshua spent 9 months touring with Grease as Eugene in Europe and 2 months in the US with Fame as Schlomo where he played both the piano and violin live on stage. He joined the cast of the long-playing small musical Equity production of Bark as Chester and stayed with it for 8 months. As Joshua grew musically his taste for jazz grew. He plays jazz piano, jazz guitar, and jazz violin. 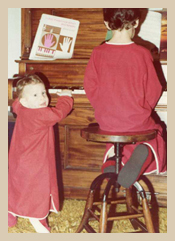 He enjoys jamming and naturally grew into teaching piano and voice. Overtime Joshua discovered he enjoys contributing to the design of a show as much as starring in a show. Musical direction became his ambition. Joshua musically directed an original musical at the Lee Strasberg Theatre & Film Institute, The 1920's Skidoo Revue, an original summer musical production at PCC called Broadway Songbook, The Apple Tree for Pasadena City College, and vocally directed and co-musically directed City of Angels for Pasadena City College also playing jazz piano in the 30 piece pit orchestra with Cy Coleman's wife in attendance. He musically directs for local children's theatre. In February 2013 Joshua made his Equity waiver debut as musical and vocal director, pianist and performer in And the World Goes 'Round. He has been in love with the music of this revue since studying it in performing arts school. He played the entire musical score on stage and sang the opening number, a duet, and several others. Besides musically directing, Joshua has recently discovered his songwriting ability. He composes songs with his brother, Jeremy Alan, a lyricist, and has discovered another new talent: film scoring. Joshua has recently been discovered by a famous rock band which wants him to play keyboards and do backup singing. They are interested in his jazz background. Joshua lives in Burbank, CA where he grew up. His education has been with select teachers whom he honors by naming them. He studied music extensively both before and after having experienced musical theatre at Hamilton High School's Academy of Music. 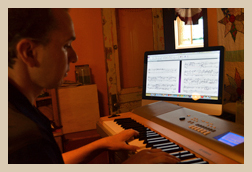 He continues to study with USC music instructors and never intends to stop.